A cleft palate is a gap or split in the roof of the mouth (the palate). It occurs when the palate of a fetus does not develop properly during the first months of pregnancy. Tonya and Phil were excited to hear their newborn son's first cry, but they were shocked when they saw him for the first time; baby Philip's upper lip was split up the middle. The doctor told them that Philip had a cleft palate as well as a cleft lip, and that both are fairly common birth defects. The doctor reassured Philip's parents that Philip was otherwise a very healthy baby—the cleft lip and palate would cause Philip some problems, but none that could not be overcome. A plastic surgeon would repair Philip's lip and palate, and a team of specialists would work on problems with his teeth, ears, and speech. Cleft means gap or split, and the palate is the roof of the mouth. A cleft palate occurs when the roof of the mouth in a fetus * does not develop properly during pregnancy, leaving a hole between the nose and the mouth. The palate extends from the top teeth to the uvula (YOOV-u-la), which is the little piece of tissue that hangs in the back of the throat. There is a bony hard palate (which can be felt just behind the top teeth) and a muscular soft palate (just behind the hard palate). A fully formed palate is necessary to close off the nose and throat from the mouth. It keeps food from going up the nose, and it pushes food to the back of the throat when a person is swallowing. The palate also is important for speaking because it keeps air from going out of the nose instead of the mouth. * fetus (FEE-tus) is the term for an unborn human offspring during the period after it is an embryo, from 9 weeks after fertilization, until childbirth. The mouth and nose of a fetus develop early during pregnancy: between 5 and 12 weeks. Three developing areas must fuse (close) together to form the face. The pieces that form the palate usually come together like a zipper—when the growth process is disturbed for some reason, the zipper does not close all the way, leaving a cleft. Formation of the palate and the upper lip are separate processes, but they are linked, and many children born with a cleft palate also have a cleft lip. 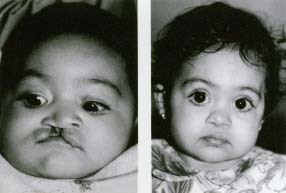 A cleft lip impairs sucking, speech, and appearance. The size and severity of a cleft depends on how much of the palate or lip has fused together. Clefts can consist of one split down the middle (a unilateral cleft) or two splits (a bilateral cleft). A cleft palate is a gap or split in the roof of the mouth (palate). The palate fuses closed (left) as a normal part of fetal development. If the palate does not fuse correctly, it can result in a partial cleft palate (middle), or a complete cleft palate and cleft lip (right). Why Are Babies Born with Cleft Palates and Cleft Lips? Cleft palates and lips probably are the result of a number of factors acting together. One in five cases is inherited, probably through the interaction of many different genes * . In most cases, however, clefts seem to be caused by environmental factors that the fetus is exposed to early in pregnancy. The German measles (rubella) virus, other infections, vitamin deficiencies, some medications, alcohol and drug use during pregnancy, all seem to increase the likelihood of a child being born with a cleft lip or palate. Prevention efforts are focused on teaching the public about these risk factors during pregnancy. As a baby, Shantell had surgery to repair her complete cleft palate and cleft lip. Here she is before (left) and after (right). Courtesy of Janet Salomonson, MD., Santa Monica, CA/Cleft Palate Foundation. A cleft lip is a highly visible disfigurement, and a cleft palate can cause abnormal growth of the face. Uncorrected, they can lead to serious self-esteem problems. When a person speaks, sounds are made by directing air through the nose or the mouth. A complete upper lip also is required to make certain sounds. A cleft palate, however, lets air escape out the nose all of the time, resulting in unusual sounds. A hole in the palate can allow food or liquid to come out of the nose. Usually, the palate acts as a barrier and prevents this problem. Because a cleft palate allows liquid to invade the sinuses and ear tubes, children with cleft palates are prone to ear and sinus infections. Many children with cleft palates and/or cleft lips have dental problems such as missing bone, missing or malformed teeth, and malocclusion (top and bottom teeth that do not fit together properly). Such problems interfere with chewing and cause facial disfigurement. Some children with clefts also have congenital heart problems, growth disorders, or learning problems. Fixing Philip's cleft lip and palate will require several surgeries. When he is about three months old, a plastic surgeon will repair his lip by stitching the edges together using flaps of skin from other parts of his mouth. Philip's cleft palate will be repaired when he is between six months and a year old. If Philip is prone to ear infections, the doctor will put tubes in his ears to help drain them of the fluid that leads to infection. These repairs are done as early as possible to prevent hearing and speech problems. Philip also may require several cosmetic surgeries to adjust his facial features as he grows older. He may need dental work to encourage jawbone growth and to straighten his teeth. He will have his hearing checked frequently by a hearing specialist (an audiologist), and he will work regularly with a speech therapist to learn how to train his palate muscles to work properly. Philip and his parents will have a lot to deal with over the next several years, but his prognosis is good. The doctor expects that when Philip enters first grade, he will be speaking well, and he will have barely a scar where his cleft lip once was. Clefts are one of the most common birth defects in the world. Approximately 1 in 700 babies is born with a cleft palate and/or cleft lip. More than 5,000 babies are born in the U.S. each year with these problems. Among people with clefts, 50 percent have both a cleft palate and a cleft lip; 30 percent have only a cleft palate; and 20 percent have only a cleft lip. Boys are twice as likely as girls to have a cleft lip or a cleft lip and palate, whereas girls are twice as likely as boys to have just the cleft palate. People of Asian, European, and Native American ancestry are more prone to clefts than other ethnic groups. Clefts are least likely to occur in people of African ancestry. Cleft palate repair requires multiple surgeries, and many people do not have access to or money for the medical care they need. In 1982, Dr. William P. Magee (a plastic surgeon) and his wife Kathleen (a nurse and social worker) founded Operation Smile to help make a difference. Operation Smile and its volunteers provide free reconstructive (repair and rebuilding) surgery and other medical services for children in the United States and in 20 developing countries. Operation Smile volunteers have performed facial surgery on 50,000 children since 1982. In 1999, Operation Smile's "World Journey of Hope '99" helped 5,000 children in 19 countries. Berkowitz, Samuel. The Cleft Palate Story: A Primer for Parents of Children with Cleft Lip and Palate. Chicago: Quintessence Press, 1994. Charkins, Hope. Children with Facial Difference: A Parent's Guide. Bethesda: Woodbine House, Inc., 1996. U.S. National Institute of Dental and Craniofacial Research, Building 31, Room 2C35, 31 Center Drive, MSC 2290, Bethesda, MD 20892-2290. American Cleft Palate-Craniofacial Association, 104 South Estes Drive, Suite 204, Chapel Hill, NC 27514. Operation Smile, 6435 Tidewater Drive, Norfolk, VA 23509. (757) 321-7645.